We do our best to keep track of the latest and greatest things that are coming to market from our favorite brands, but every once in a while something pretty awesome slips through the cracks. Case in point are the Chappaqua Duffels by Hudson Sutler with an assist from Wm. Lamb & Son. How we missed these earlier this year will forever be a mystery. Available in both commuter and weekender sizes, the Chappaqua Duffels are perfect for everything from daily trips to the gym, to weekend camping excursions. Made from heavy 18oz. 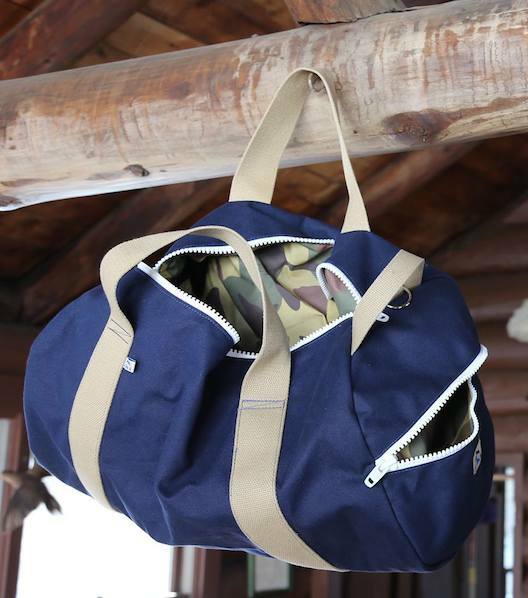 navy canvas paired with cotton khaki handles, these bags are relatively low key on the outside, but the liner is a whole different story. Inside you’ll find Wm. Lamb & Sons “On the Wing” camo print. It may look like classic camouflage at first, but upon further examination you’ll see it is actually made up of silhouettes of ducks in various stages of flight. Finished off with a rust proof resin zipper and nickel hardware, these bags will stand up to anything you throw at them and then some.